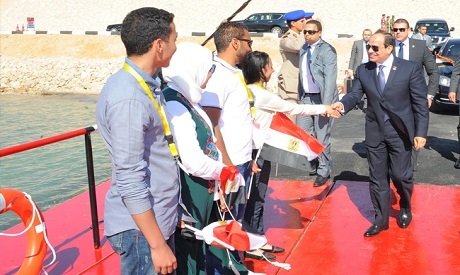 Egyptian President Abdel-Fattah El-Sisi toured on Wednesday the ongoing construction of the Suez Canal tunnels during his three-day stay in Ismailia governorate while attending a semi-regular youth conference, state news agency MENA reported. The tunnels project aims to connect the Sinai Peninsula with the Nile Delta. During his visit, El-Sisi commented that the project was executed by Egyptians and that no foreign companies had been hired to complete it. He added that construction on the project’s four tunnels would be completed by 30 June. The youth conference sessions and workshops are planned to address issues including a recent surge in the price of foodstuffs, the government's efforts to improve the healthcare system and sustainable development in the fields of gas and power. This month's event is the third in a series of such gatherings.